Beijing(web team): Reaching out to Chinese investors, Prime Minister Narendra Modi on Saturday asked them to take advantage of the "winds of change" in India with a much more transparent, responsive and stable regulatory regime even as leading firms from the two sides signed 26 deals worth more than USD 22 billion. "This is a historic opportunity for Chinese companies," Modi said addressing the India-China Business Forum here in China's financial hub after interacting with 22 CEOs of top Chinese companies, including Alibaba Group chairman Jack Ma. China and India on Saturday signed deals worth more than $ 22 billion in areas including renewable energy, ports, financing and industrial parks, an Indian embassy official said on Saturday. "The agreements have a bilateral commercial engagement in sectors like renewable energy, industrial parks, power, steel, logistics finance and media and entertainment," Khampa said. Prime Minister Narendra Modi launched a Centre for Gandhian & Indian Studies at Fudan University. Chinese students recited verses from the Bhagwad Gita at Opening Ceremony of Centre for Gandhian & Indian Studies. Today yet again China has opened a doorway into philosophies of Gandhi, which I consider a landmark event. Today World is facing two major problems - terrorism and global warming. Mahatma Gandhi is a 'Yug Purush' and a 'Vishwa Manav'. Prime Minister Narendra Modi on Saturday addressed India-China Business forum after meeting top 22 Chinese CEOs in Shanghai and said he strongly believes that this century belongs to Asia. India has always been a knowledge society. You have been an innovating society. As we helped each other growing spiritually, we have to help each other growing economically. The scope and potential, the breadth and length of infrastructure and related developments is very huge in India. 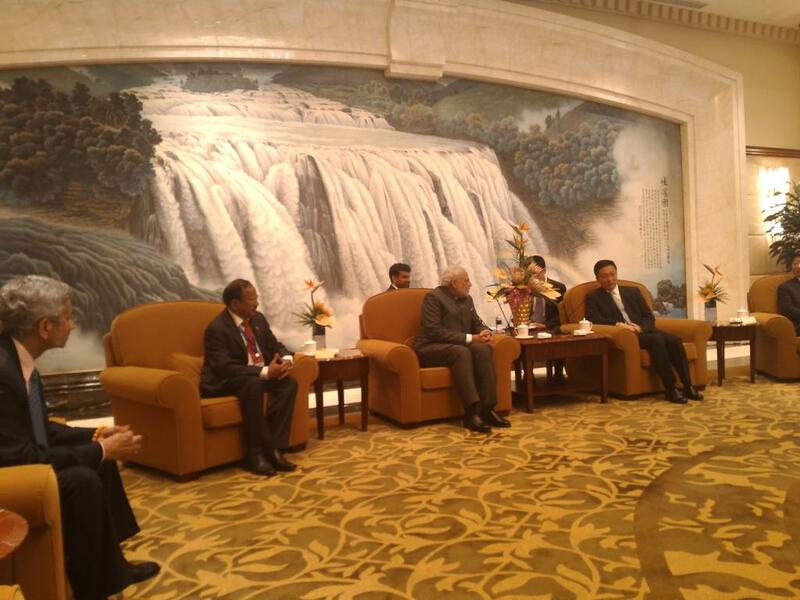 Indo-Chinese partnership should and will flourish, says PM Modi at India-China Business Forum in Shangha. Harmonious partnership between India and China is essential for economic development and political stability of Asia. 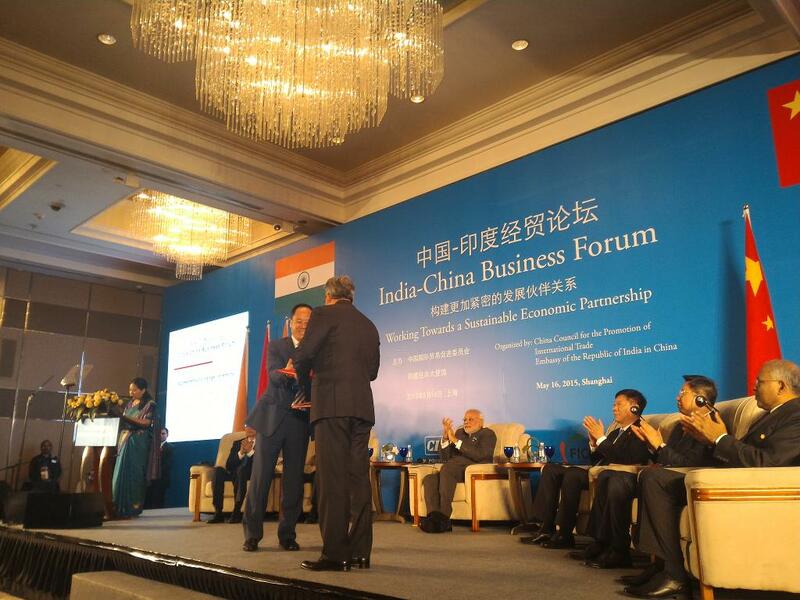 India and China have potential of growth and problem solving. I am personally committed to take the co-operative process forward. 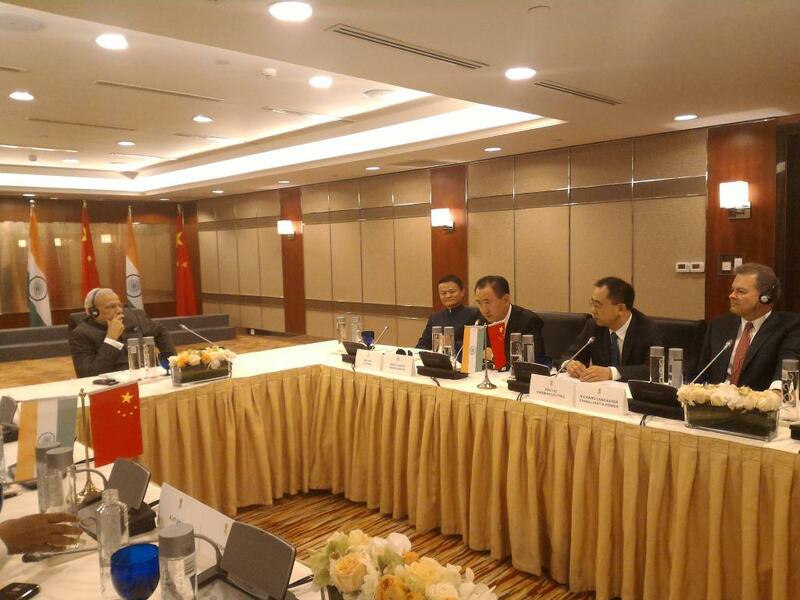 Prime Minister Narendra Modi on Saturday met 22 top Chinese CEOs in Shanghai and pitched for make in India. Interacting with CEO's of Chinese companies, Prime Minister Narendra Modi said, "I have come to say to you Make in India"
Modi also said that India and China can together give something to the world. Trillions of dollars under 1 roof! Prime Minister Narendra Modi arrived in Sanghai on Friday for the third and final leg of his three-day China visit that also took him to Xi'an and Beijing. 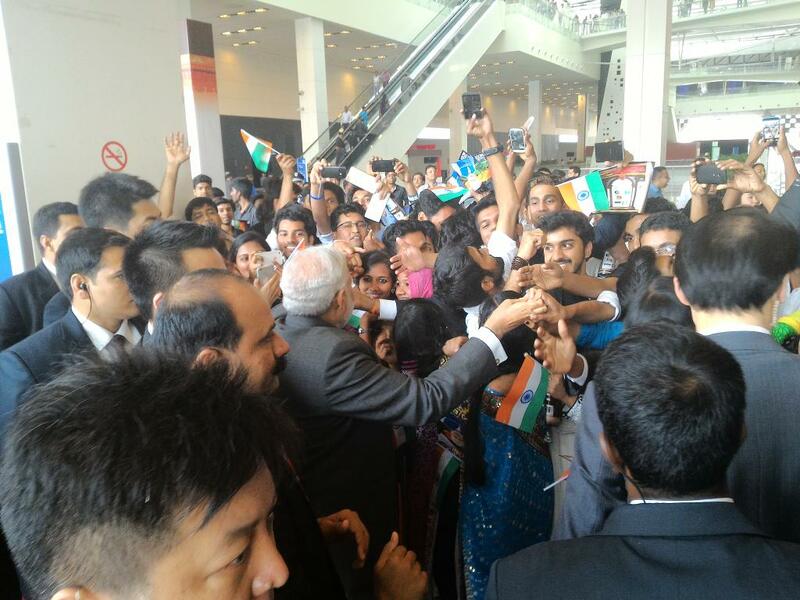 Modi arrived yesterday in Xi'an where he held summit-level talks with President Xi Jinping. He then moved to Beijing where he held wide-ranging parleys with his Chinese counterpart Li Keqiang today. Tomorrow Modi will meet with CEOs of top Chinese companies and a number of agreements worth USD 10 billion are expected to be signed. Prime Minister Narendra Modi on Friday said both India and China face the threat of growing extremism and terrorism whose source "is in the same region", in a veiled reference to terror networks in Pakistan. Modi, while addressing students at the Tsinghua University in Beijing , asserted that India and China face instability in their "shared neighbourhood" that can threaten the security and slow down the economies of the two countries. "The spreading tide of extremism and terrorism is a threat we both face; for both, its source is in the same region," he said in an apparent reference to the cross-border terrorism faced by India and China originating in Pakistan. Terror strikes in India like the 26/11 Mumbai attacks have often been traced to Pakistan while unrest in China's Xinjiang province is many times linked to separatists trained in camps in Pakistan. "We must also deal with the changing character of terrorism that has made it less predictable and more diffuse. We source a large part of our energy from the same region that faces instability and uncertain future," Modi said. India, China decide to have more Border Personnel Meeting Points as part of efforts to maintain peace and tranquility on the boundary. India,China to set up task force to look into trade imbalance and other economic issues, says Foreign Secretary S Jaishankar. Speaking at the forum, PM Narendra Modi said, "This forum has a special place in my heart. As I saw in my experience State government can take innumerable initiatives for development of states. In India's Constitution, state governments have predominant role in economic and social development." He further added, "I speak of Team India. I believe foundation for India's development will not be single pillar of Centre but 30 pillars of Centre, States. I speak of Cooperative Federalism, when the Centre and the States are partners." Stating that such a forum is a first that India has with any country, Modi said, " We are truly taking our relationship outside our national capitals to state capitals and cities." Prime Minister Narendra Modi on Friday said that China must reconsider its approach on certain issues in order to realise the full potential of its partnership with India, adding that the two Asian giants have a ‘historic responsibility’ to use their relationship for the good of the world. Addressing media after signing ceremony, PM Modi said, "I am very grateful to President Xi for his special gesture of hosting me in Xian; and, for showing me the city's extraordinary heritage. It is a treasure of the world. I am pleased to visit China in the first year of my Government. This is one of our most important strategic partnerships." Modi further added, "Our relationship has been complex in recent decades. But, we have a historic responsibility to turn this relationship into a source of strength for each other and a force of good for the world. We are committed to set a new direction between the two largest Asian countries." “My conversations with [Chinese] Premier Li Keqiang were candid, constructive and friendly. I stressed the need for China to reconsider its approach to some issues that hold us back from realising the full potential of our partnership. We both reiterated our strong commitment to make all efforts to maintain peace and tranquillity in the border region,” he added. Modi also stressed the need for strengthening mutual trust and confidence while seeking solutions to outstanding issues. The Prime Minister said, "I sought tangible progress on issues relating to visa policy and trans-border rivers. I also discussed some of our regional concerns. We agreed that as we move ahead, we should be sensitive to each other's interests; strengthen mutual trust and confidence; continue to manage our difference with maturity; and, seek solutions to outstanding issues." "On the boundary question, we agreed that we continue to explore a fair, reasonable and mutually acceptable resolution. We both reiterated our strong commitment to make all efforts to maintain peace and tranquility in the border region," said Modi. Stating that he looks forward to working with President Xi and Premier Li, Modi said, "I have welcomed President Xi's proposal to hold regular summits to realize our vision for the relationship. I have also invited Premier Li to visit India at an early date." Agreements on Railways, Education Exchange Program, Mining and Mineral sector, Space Co-operation, Broadcasting between CCTV & DD, Tourism Co-operation, India-China Think Tank Forums, Earthquake Science & Engineering, Development Research Centre and NITI Aayog, Co-op on Ocean Science were signed between India and China.